Last summer, I enrolled in the Global Entry program through the Department of Homeland Security's U.S. Customs and Border Protection. This past week, I finally got to put my status to good use (and enjoy expedited clearance) while re-entering the U.S. from Mexico. Global Entry cost me $100, and I can tell you it was worth every single penny. 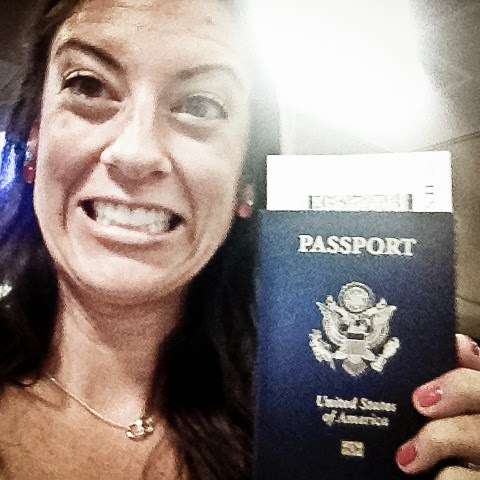 If you are planning an international trip in the near future, read on to see why you need it!! First, getting Global Entry can be somewhat of a hassle depending on where you live and/or how often you find yourself at big airports. After filling out background information and paying your $100, you will need to book an in-person interview at one of the Global Entry Enrollment Centers (most are located at big airports). I was lucky that the Phoenix airport happens to be one of the centers, so it was an easy drive for me and I even toted Parker along (he was a baby baby at the time). At the appointment, the interviewer will confirm your information and history, and will instruct you on how to use the Global Entry kiosks - your new way to immigrate! So here's how my experience went down... I flew from Cancun to Dallas where I got off the plane and headed to Immigration. The U.S. Citizens line was loooooong, but instead I followed the Global Entry signs to a cluster of computerized kiosks. All empty. I walked up to one and scanned my passport like I was taught to do during my interview and had my fingertips scanned, then was awarded with a transaction receipt. Even though had Max reminded earlier, I forgot to look up at the kiosk's camera which takes a picture during the process. So, my receipt showed a photo of me, eyes half-closed, putting my hair in a pony. Awesome. Max was going through the same process at about the same time at a different airport and I wanted to send him a photo of my receipt, a "who can take the more terrible picture" contest, but alas, no cameras allowed during immigration/customs. I took my transaction receipt, placed it inside my passport, and literally walked through the kiosk area to Baggage Claim without stopping. There was an attendant at the kiosks who checked to see I had a receipt, but I wasn't even stopped. I actually had to look around to confirm to myself that, yes, it really was that easy. I had carried my suitcase on the plane with me, so I didn't need to collect any bags at Baggage Claim and instead went straight to customs. Again, a looooong line. I was about to step into it, then noticed that Global Entry had its own customs line. And by line I mean a roped off pathway, because once again, it was completely empty. I walked through, handed my transaction receipt to the TSA agent, and I was done. Minutes. It took minutes. Once on the other side, I kind of looked around, making sure I wasn't missing anything. I mean, it couldn't have been that easy? Oh, but it was. I later told Max that I liked Global Entry because it made me feel super special :) It was unreal. As a bonus, having Global Entry also gives you TSA Pre-Check when flying domestically. This was the original reason I signed up for Global Entry - I knew I would be flying quite a bit with Parker and I wanted to make it as easy as possible. TSA Pre-Check lets me keep my shoes on while going through security (soooo nice when I have baby in tow), I don't have to worry about putting my liquids in a baggie, and I don't need to remove my laptop from my bag. Lots of times the Pre-Check line is super short, so I've literally walked completely through security a number of times without even stopping. If $100 seems like a high price to pay for this convenience, think of it instead on a price-per-use basis. Global Entry is good for five years. We estimated I'd be taking ten flights a year, which would be 50 flights for $100, or, $2 a flight. Two dollars a flight didn't seem bad at all! This past year was actually a 20+ flight year, so we way underestimated my flight count, and I will most likely come in much below that $2 a flight price! And that's not even taking the Global Entry portion into account! If you are wondering about my littlest love, Parker goes through Pre-Check with me without needing anything special. However, had he been on my Mexico trip with me he would have needed his own passport and therefore his own Global Entry enrollment to accompany me through the process (same goes for grown-up travel companions). I'd be happy to answer any questions on Global Entry! I'm in love, and I think you will be, too! If you have any foreign travel planned, definitely consider enrolling! I have Global Entry and I love it! I haven't gotten to use it coming back into the country yet (soon!) but I have gotten Pre-Check for all of my flights since. Best thing ever!